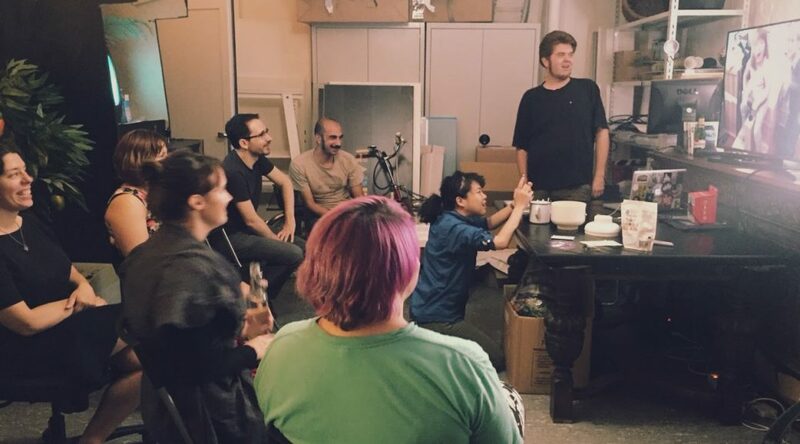 Last Friday, September 16th, we kicked off the 3rd annual Alt Ctrl Game Jam at Saftladen. The Alt Ctrl Game Jam is an online international jam that runs from September 16th to September 26th. Participants are challenged to make a game and an original controller or input device. We met up with a lovely bunch of people and talked about controllers, weird contraptions, human interaction and physical play. There was candy and a huge pile of cables and old devices (special thank you to Almut Schwacke). First off, I presented my thoughts and experiences about working with alternative controllers. It’s an exciting development in indie games that now also gets recognition in the form of an IGF award in 2017. Games are even more exciting if we can make the experience more physical, out into the real world. A lot of developers have been building their own physical interfaces, and this will only increase in the future. Games that are more like installations and performance pieces tend to challenge the audience, but also to include more people. Next up, we had developer-and-father Finefin, who last year with his children made The Zeppelin Game. Based on a controller that was built at Saftladen, they won the 2015 Alt Ctrl Game Jam. The installation was exhibited at Game Science Center afterwards, which gave him a good way to test and improve the device. Due to his experience with self-built devices, Finefin was recently approached to work on room escape games, which he is now doing with a lot of satisfaction. One of the funniest Alt Ctrl creations to come out of Berlin is the Monocle game by Luca Scaramuzzino. He brought the game and demonstrated how it should work. There are not many games controlled with your eye socket, so Luca is really tending to a neglected market. Our second father-and-developer of the evening, Firepunchd, talked about several projects of his. First off, it was the custom jump pads he built for Chicken Jump, and that have now gone through several iterations. A lot of testing with children helped a lot. At last year’s jam he built a controller out of an old stereo amplifier, for the game Happy Toy Inc. With that very complicated game, he won 3rd prize. We closed the evening by preparing for the jam. The ideas that were brought up ranged from devices made of cloth, to a game that detects the human face, and one that involved an old tape deck. Some people offered to help with the technical part, which is always very useful. Building an alternative controller game is a lot of work, because you have to make both a game and the interface, but it can be very satisfying to see your creation being played. Thinking about how people will play your game is a good start when coming up with ideas. Even in the case you will only show your project once, you will have a lovely Vine you can share with the world, with people jumping, hitting things, laughing while playing: way more exciting than someone on a mouse and keyboard! Do you want to build something? It’s not too late to join the jam! Make something at the September Berlin Mini Jam, or just start right now. Check altctrlgamejam.com for more details, and join the Berlin Game Dev Slack chat by contacting me. Featured picture by Sjors Houkes. Vines by Nomi.